In Mount Carmel Cemetery in Verona, Pennsylvania is the headstone of my third great grandparents, Martin and Elizabeth Kreher Witt. Martin was born in 1830 in Gernsheim, Gross-Gerau, Hessen, Germany and arrived in the United States when he was just two years old. His wife Elizabeth Kreher was born in Herman, Butler, Pennsylvania in 1840. Finding Herman took some doing as today it’s nothing more than the intersection of Herman Road and Bonniebrook Road. Aside from the volunteer fire department, a convenience store, cemetery and school, you wouldn’t think much of it. The Witt’s spent most of their lives in western Pennsylvania and their final years in Pittsburgh. I can’t in the least take credit for this image. As I’ve mentioned before, the genealogy community is awesome in that sometimes total strangers offer something great that you couldn’t retrieve yourself. In this case, I posted a request on FindAGrave.com (yes, that’s a real site – with 107 MILLION grave records) for someone to post a photo of the headstone for Martin and Elizabeth. A few months later, Mary Mathewson posted this photo. A quick email exchange and we discovered we are researching the same ancestors and shared information and family photos. It’s this kind of sharing and collaboration that make genealogy so much fun! 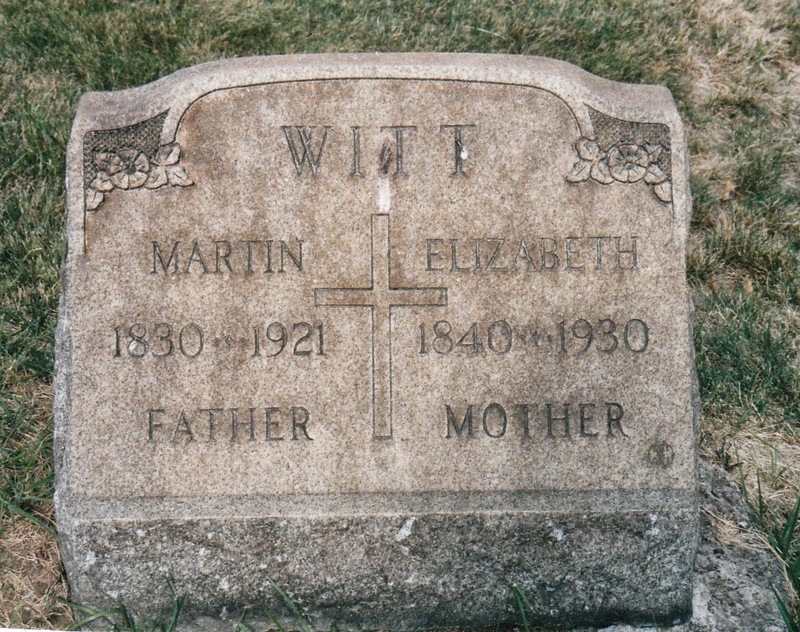 Find A Grave, Inc. Find A Grave.com, digital images (http://www.findagrave.com: accessed 15 October 2013), photograph, gravestone for Martin (1830 – 1921) and Elizabeth (1840 – 1930) Witt, Verona, Allegheny, Pennsylvania.